Azure Cosmos DB is Microsoft’s globally distributed, highly available, multi-model database service. 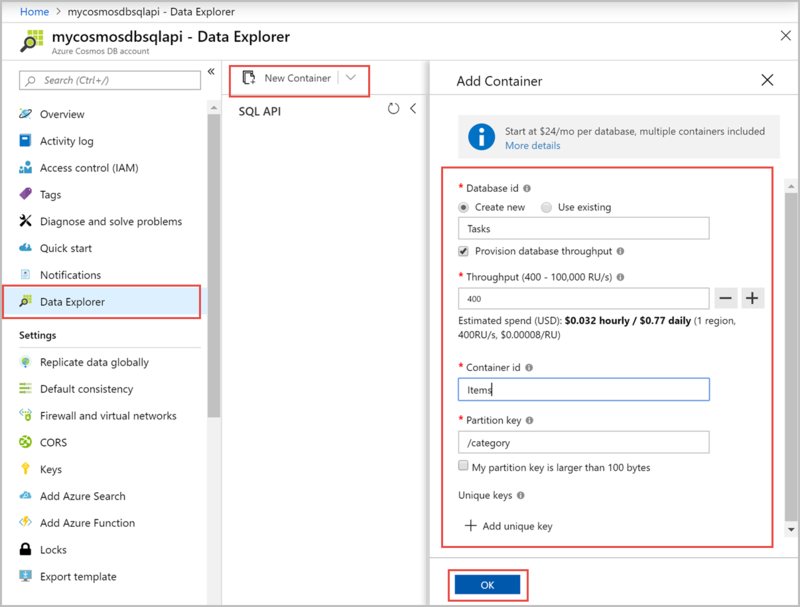 You can quickly create and query document, key/value, and graph databases, all of which benefit from the global distribution and horizontal scale capabilities at the core of Azure Cosmos DB. 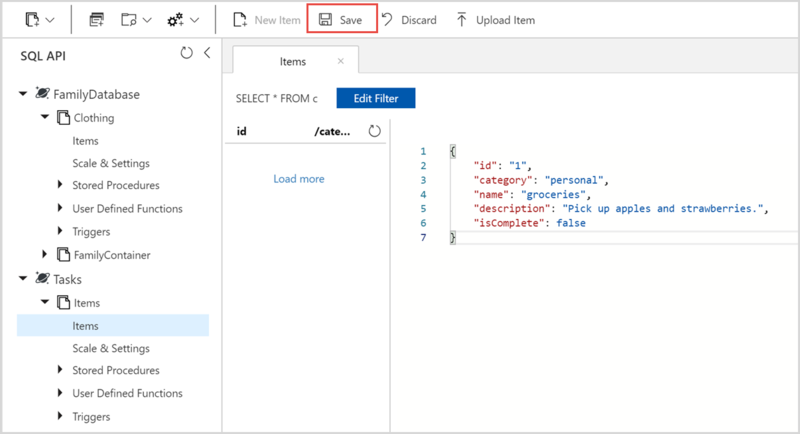 This quick start demonstrates how to create an Azure Cosmos DB SQL API account, database, and container using the Azure portal. You'll then build and deploy an ASP.NET To-do List web app built on the SQL .NET API, as shown in the following screenshot. This quick start uses Version 3.0+ of the Azure Cosmos DB .NET SDK. If you don’t already have Visual Studio 2017 installed, you can download and use the free Visual Studio 2017 Community Edition. Make sure that you enable the Azure development workload during the Visual Studio setup. Enter a unique name Select Create New, then enter a new resource-group name for your account. For simplicity, you can use the same name as your Account Name. The ID can only contain lowercase letters, numbers, and the hyphen (-) character, and it must be between 3 and 31 characters in length..
API Core (SQL) The API determines the type of account to create. 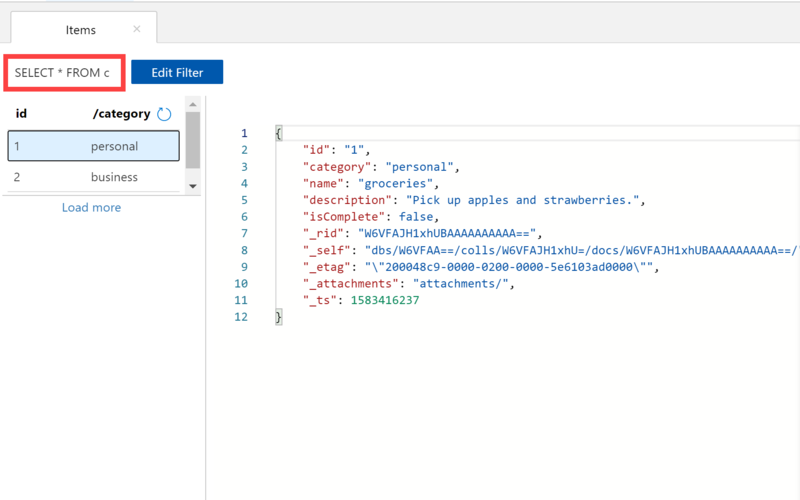 Azure Cosmos DB provides five APIs: SQL (document database), Gremlin (graph database), MongoDB (document database), Table API, and Cassandra API. Each API currently requires you to create a separate account. Select Core (SQL) because in this article you will create a document database and query using SQL syntax. Enable geo-redundancy Leave blank This creates a replicated version of your database in a second (paired) region. Leave this blank. Multi-region writes Leave blank This enables each of your database regions to be both a read and write region. Leave this blank. Then click Review + create. You can skip the Network and Tags section. Review the summary information and click Create. The account creation takes a few minutes. Wait for the portal to display the Your deployment is complete message and click Go to resource. The portal will now display the Congratulations! 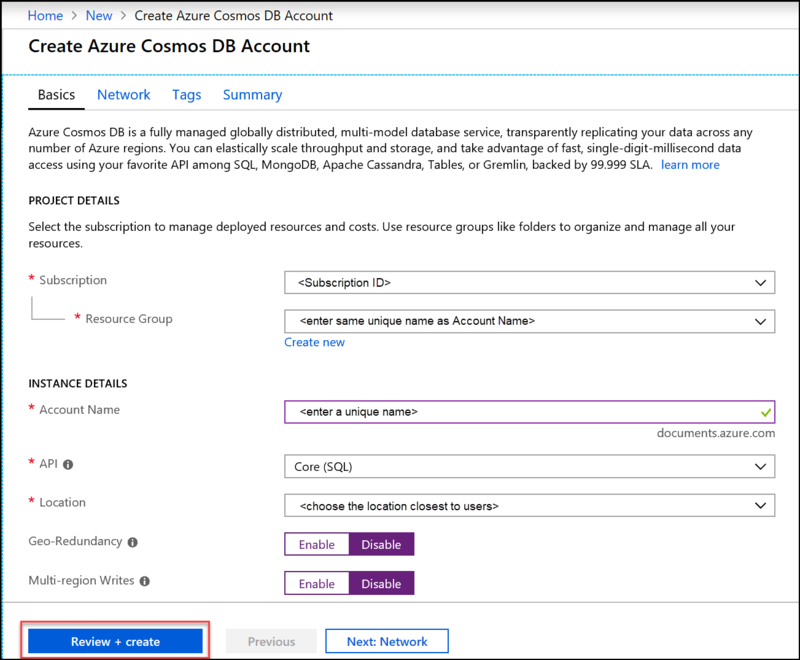 Your Azure Cosmos DB account was created page. Database id Tasks Enter Tasks as the name for the new database. Database names must contain from 1 through 255 characters, and they cannot contain /, \, #, ?, or a trailing space. Provision database throughput Leave blank Azure Cosmos DB can provision throughput at either the database level (all collections in a database share the same throughput) or at the collection level. Leave blank to provision throughput at the collection level for this particular collection. Storage capacity Unlimited Choose the Storage capacity of Unlimited. Partition key /category Enter "/category" as the partition key. Setting a partition key allows Azure Cosmos DB to scale your collection to meet the storage and throughput needs of your application. In general, a good choice of partition key is one that has a wide range of distinct values, and results in an even distribution of storage and request volume across your workload. Learn more about partitioning. Throughput 400 RU/s Change the throughput to 400 request units per second (RU/s). If you want to reduce latency, you can scale up the throughput later. Now let's switch to working with code. Let's clone a SQL API app from GitHub, set the connection string, and run it. 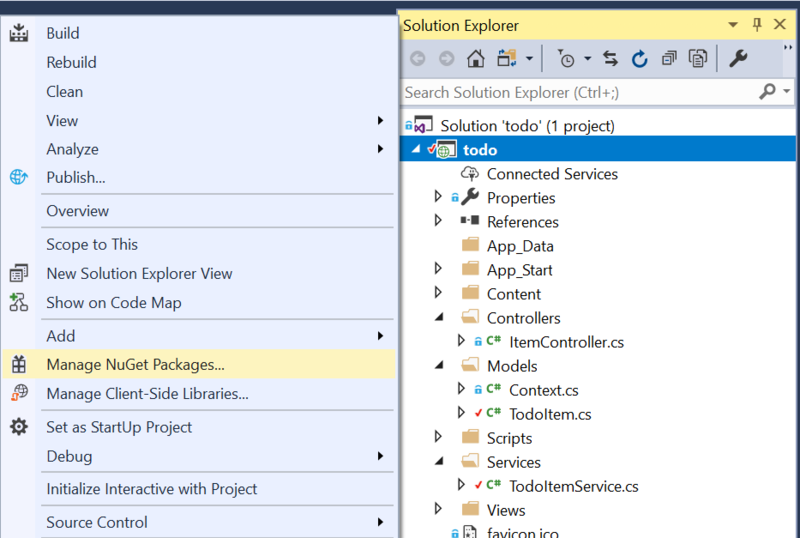 Open the todo.sln solution file in Visual Studio. Note, if you are familiar with the previous version of the .NET SDK, you may be used to seeing the terms 'collection' and 'document.' Because Azure Cosmos DB supports multiple API models, version 3.0+ of the .NET SDK uses the generic terms 'container' and 'item.' A container can be a collection, graph, or table. An item can be a document, edge/vertex, or row, and is the content inside a container. Learn more about databases, containers, and items. The following snippets are all taken from the ToDoItemService.cs file. The CosmosClient is initialized on lines 68 - 69. A new database is created on line 71. A new container is created on line 72 with partition key "/category." 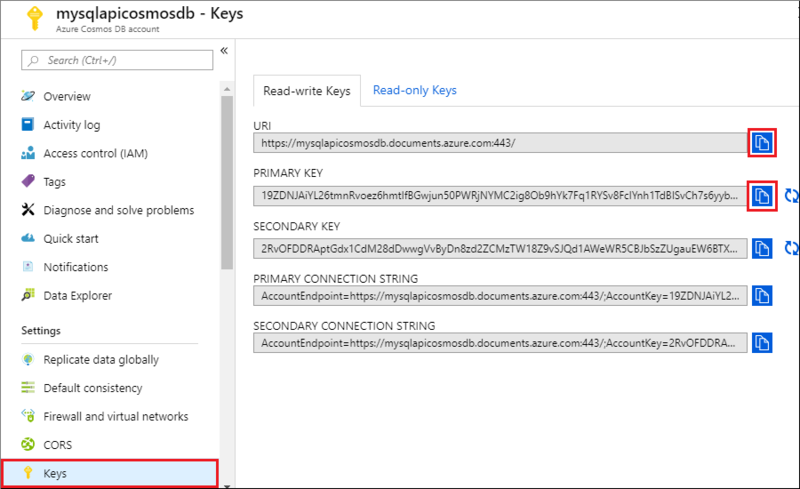 In the Azure portal, in your Azure Cosmos DB account, in the left navigation select Keys, and then select Read-write Keys. You'll use the copy buttons on the right side of the screen to copy the URI and Primary Key into the web.config file in the next step. In Visual Studio 2017, open the web.config file. Copy your URI value from the portal (using the copy button) and make it the value of the endpoint key in web.config. Then copy your PRIMARY KEY value from the portal and make it the value of the primarykey in web.config. Then update the database and container value to match the name of the database and container you created earlier. 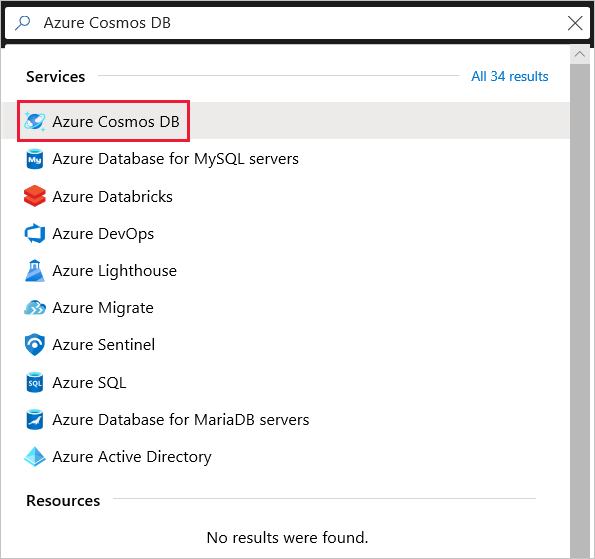 You've now updated your app with all the info it needs to communicate with Azure Cosmos DB. 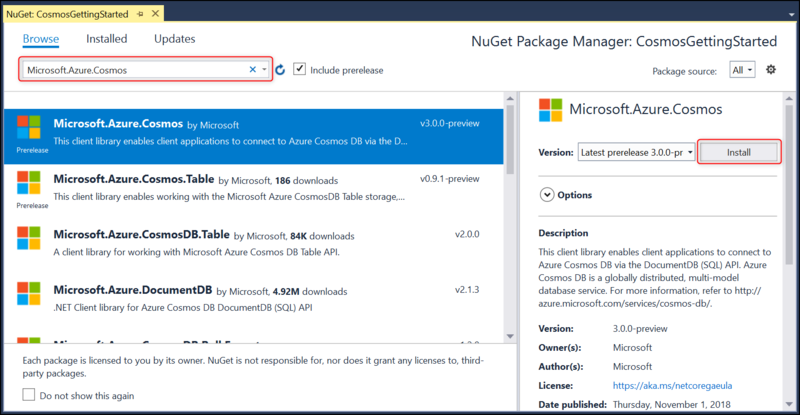 In the NuGet tab, click Browse, and type Microsoft.Azure.Cosmos in the search box. Within the results, find Microsoft.Azure.Cosmos and click Install. 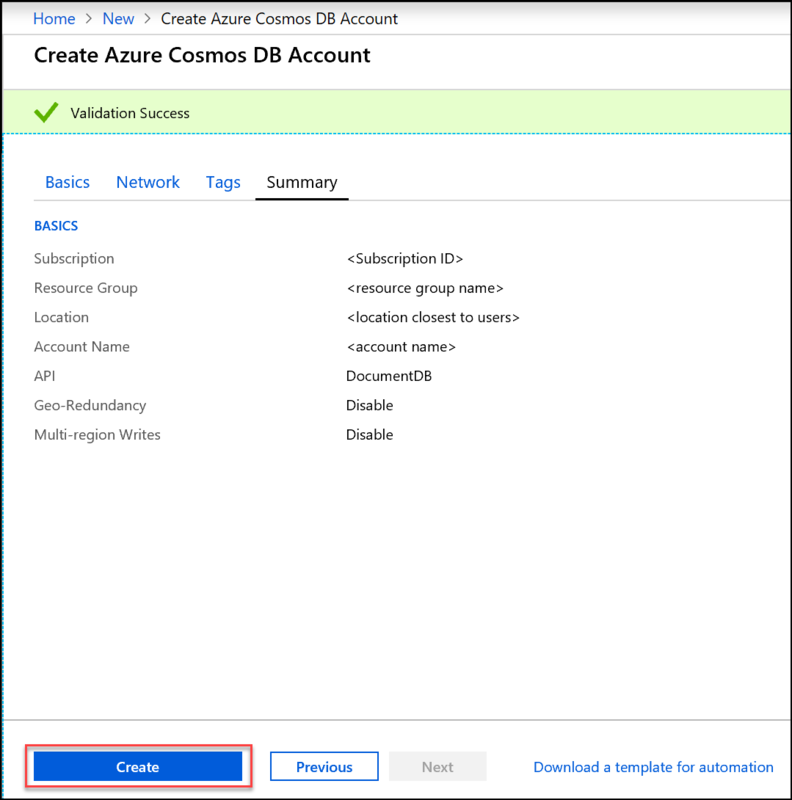 The package ID for the Azure Cosmos DB SQL API Client Library is Microsoft Azure Cosmos DB Client Library. If you get a message about reviewing changes to the solution, click OK. If you get a message about license acceptance, click I accept. Select CTRL + F5 to run the application. Your app displays in your browser. 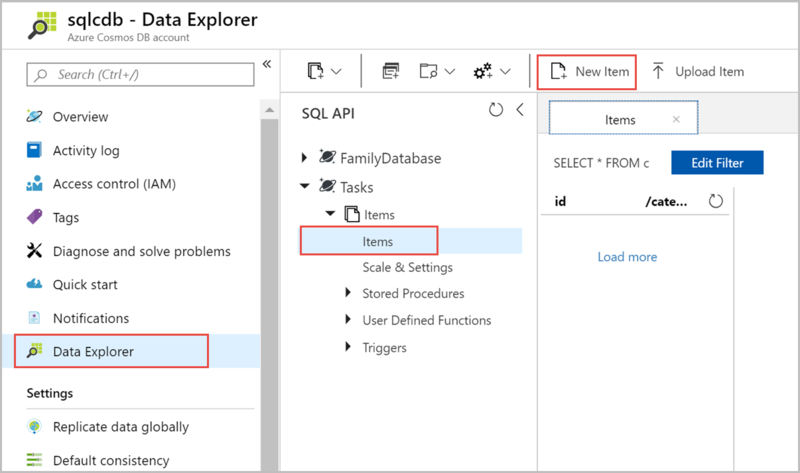 You can now go back to Data Explorer and see, query, modify, and work with this new data. 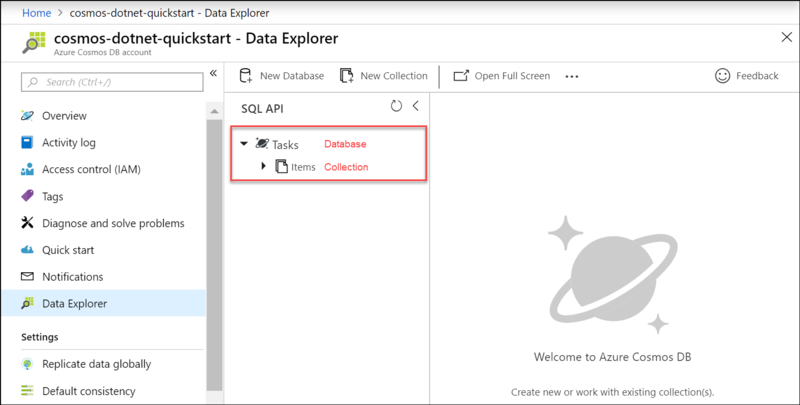 In this quickstart, you've learned how to create an Azure Cosmos DB account, create a container and add items to it using the Data Explorer, and run a web app. You can now import additional data to your Cosmos DB account.